Reserved for just a select few that occupy the highest of high-end MLB collecting, 2018 Topps Transcendent Collection Baseball returns for another season. The luxury set packs over 50 autographs per box and an exclusive invitation for a party featuring Mike Trout. Tying into the 35th anniversary of 1983 Topps, production is capped at just 83 boxes. Final pricing is a bit higher to the 2017 boxes that retailed for over $24,000 each. Using 1983 Topps as the main design inspiration, 2018 Topps Transcendent Collection Baseball includes a silver-framed base set. Every box contains the entire 50-card set, with each card numbered to 83 copies. Collectors can also find a full set of the 83 Origins Sketch Reproductions (#/83) cards to go with their one hand-drawn Transcendent Moments Sketch (1/1). 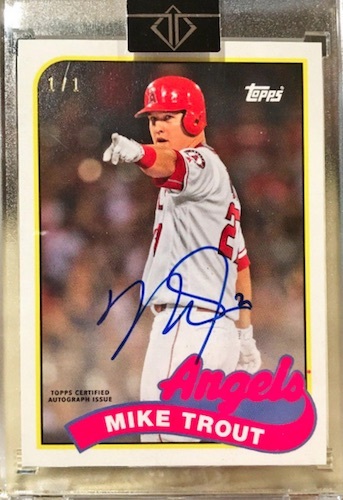 The 2018 Topps Transcendent Collection Baseball checklist is filled with many on-card signatures, as well. The bulk of these come in the Transcendent Collection Autographs line. Boxes promise 48 signed cards from the Base (#/25), Emerald (#/15) and Purple (#/10) versions. In addition, there are two autographs from the one-of-one Platinum or Red parallels. Nearly all subjects have Image Variation Autographs with the same print runs and parallels as the base autograph set. These feature a new image and design for each player. As the man of the hour, "The Millville Meteor" gets his own insert set via Mike Trout Through the Years Autographs. The one-of-one set offers one framed card per box and spans the Topps design history from 1952 to 2018. Among the new choices in 2018 Topps Transcendent Collection Baseball, the Autographed 1952 SuperFractor set reimagines the classic '52 design with the Refractor finish associated with the ultimate modern chase. These come one per box. Also debuting in 2018, the one-of-one 1983 Autograph Patch and 1983 Cut Signature Jumbo Relic Book cards combine to fall one per box. 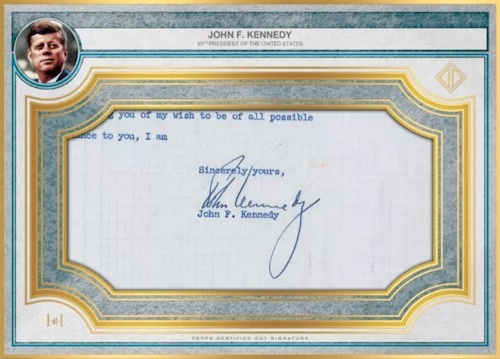 Finally, topping off each five-figure box is an Oversized Cut Signature (1/1) card from a subject list that touches on some of the biggest names in sports, entertainment, politics and history. 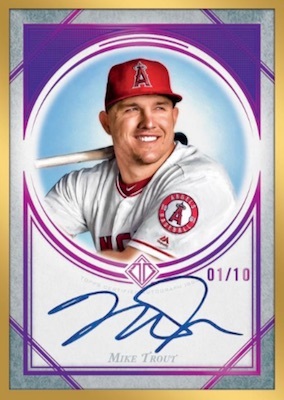 While not a traditional baseball card, per se, there is one more thing in every box of 2018 Topps Transcendent Collection Baseball, and it's pretty sweet. The VIP Experience Invitation allows access to an exclusive party with Mike Trout in attendance. The party takes place in Scottsdale, Arizona, on February 22, 2019. Previous years have included Hank Aaron (2017) and Kris Bryant (2016). 50 cards. Serial numbered #/83. 1 set per box. 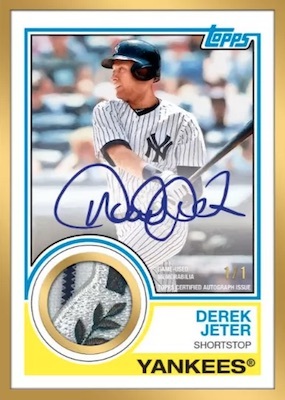 Buy 2018 Transcendent MLB autographs on eBay. 88 cards. Serial numbered #/25. Most players have vertical and horizontal versions. PARALLEL CARDS: Emerald #/15, Purple #/10, Red 1/1, Platinum 1/1. 83 cards. 1 per box. Serial numbered 1/1. 66 cards. Serial numbered 1/1. Andrew Johnson – 17th President of the U.S.
Barack Obama – 44th President of the U.S.
Bill Clinton – 42nd President of the U.S.
Calvin Coolidge – 30th President of the U.S.
Chester A. Arthur – 21st President of the U.S.
Dwight D. Eisenhower – 34th President of the U.S.
Franklin D. Roosevelt – 32nd President of the U.S.
George H.W. Bush – 41st President of the U.S.
George W. Bush – 43rd President of the U.S.
Gerald Ford – 38th President of the U.S.
Grover Cleveland – 22nd / 24th President of the U.S.
Harry Truman – 33rd President of the U.S.
Herbert Hoover – 31st President of the U.S.
James Buchanan – 15th President of the U.S.
James Monroe – 5th President of the U.S.
John F. Kennedy – 35th President of the U.S.
Lyndon B. Johnson – 36th President of the U.S.
Martin Van Buren – 8th President of the U.S.
Millard Fillmore – 13th President of the U.S.
Ronald Reagan – 40th President of the U.S.
Theodore Roosevelt – 26th President of the U.S.
William Henry Harrison – 9th President of the U.S.
William Howard Taft – 27th President of the U.S.
William McKinley – 25th President of the U.S.
Woodrow Wilson – 28th President of the U.S.
83 cards. Serial numbered #/83. 1 Origins set per box. 83 cards. Serial numbered 1/1. 1 per box. 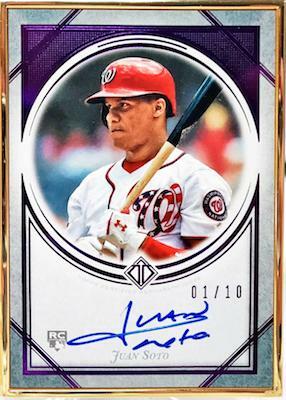 View the 2018 Topps Transcendent Collection Baseball checklist spreadsheet. Great choice on the focus player this year. Can’t go wrong with Mike Trout. Not too impressed with the names in the Jumbo Cut Auto list though. What is the point? Who cares? What is so different about these cards vs. a high end product such as Museum? All vastly overpriced and underwhelming anyway, and this is the topper. Chris – is the difference is opportunity. You can get all of this easily by purchasing this product. With Museum you may need to purchase 10 cases and guaranteed to not get this type of content. In fact, the Mike Trout experience is probably worth more than any other experience so far. I also argue the cut list is the best of the 3 years. What ever happened to the kids hobby ? player checklist is average and only a handful of cards will hold value. Extremely overrated and overprice set. 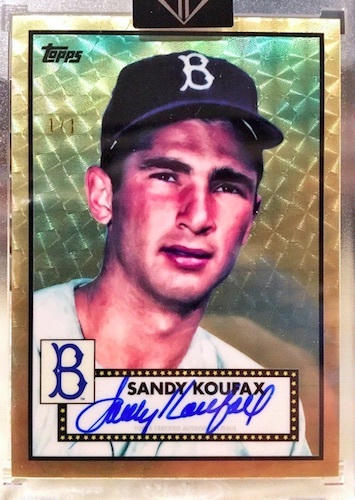 if It weren’t for the 52 SuperFractors it would probably be a 3, but TOPPS did us right. Those supers bring the magic in ways collectors who can afford to break high end deserve. I paid this much for my first house. 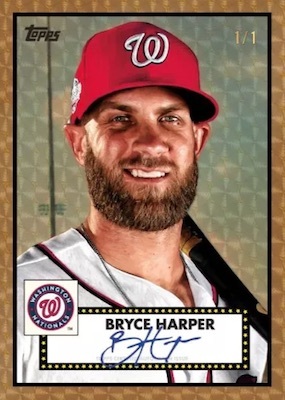 Topps continues to put less than stellar players in this set. McCutchen, Sanchez, and Pettite to just name a few. For this money, there should be more 1/1’s. The only big items are the ViP Ticket, Cut Autograph, and the 1/1 Autograph Patch.